Paw Paw Cell-Reg™ [Immune]. 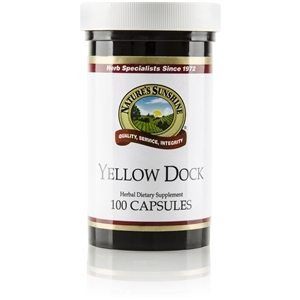 Because health begins in the body's cells, it is important to support the health of all cells. 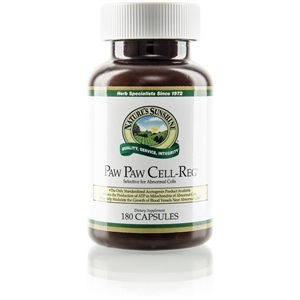 Paw Paw Cell-Reg is a unique product that selectively targets specific cells to enhance the overall health of the body . Over 50 active compounds exist in Paw Paw Cell-Reg and these complex chemicals are called acetogenins. Acetogenins affect the production of ATP in the mitochondria (the powerhouse) of the cell. ATP is the major source of cellular energy. By selectively modulating the production of ATP in specific cells, the acetogenins affect the viability of specific cells and the growth of blood vessels that nourish them. A clinical study with over 100 participants showed that the paw paw extract, containing a mixture of acetogenins, supports the body's normal cells during times of cellular stress. Paw Paw Cell-Reg is the only standardized acetogenin product available. Nature's Sunshine uses an extract of the twigs from the North American paw paw tree, which contains the most concentrated amount of acetogenins. Each two capsules contains 17 mg of standardized paw paw twig extract. 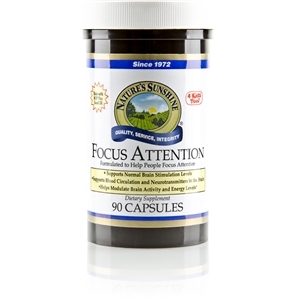 Co-Q10, Thyroid Support and 7-KetoTM may decrease the effectiveness of this product. 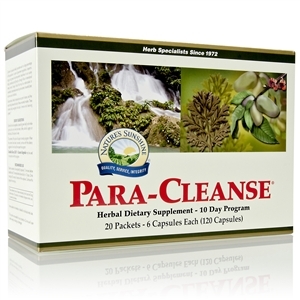 Only those with cellular abnormalities should take this product on a regular/daily basis. Do not take this product if you are pregnant, think you may become pregnant, or if you are breastfeeding. Q: Why should I avoid supplementing with Co-Q10 or products that support the thyroid while taking Paw Paw Cell-Reg? A: Taking Co-Q10 or thyroid products may decrease the effectiveness of Paw Paw Cell-Reg. Co-Q10 and thyroid stimulating-products increase the mitochondrial ATP energy production. Compounds called acetogenins, found in the Paw Paw Cell-Reg, act by decreasing this energy production. Taking both products would have a counteractive effect. It is not dangerous to take the products together, but they are both less effective. Q: Could I separate the time between the time I take Co-Q10 (or thyroid support products) and Paw Paw Cell-Reg? For example, could I take Co-Q10 in the morning and Paw Paw at night? A: NSP suggests avoiding these products altogether while taking Paw Paw Cell-Reg. Q: What about antioxidants? Should I avoid those as well? A: Taking large amounts of strong antioxidants (Vitamin A, Vitamin C, Vitamin E, SOD, Alpha Lipoic Acid, Grapine, etc.) may decrease the effectiveness of Paw Paw Cell-Reg. Generally, antioxidants are beneficial because they quench free radicals and damaging oxygen species in our cells. With a buildup of free radicals and reactive oxygen species, the cell will undergo a process of programmed cell death. It may be beneficial for this to occur in certain individuals. Taking a multivitamin and mineral should be fine. Q: Which products complement Paw Paw Cell-Reg? A: Nature's Noni (Juice or capsules), Immune Stimulator and Protease Plus complement Paw Paw Cell-Reg. Q: Can I continue to take products like E-Tea and Pau D'Arco? Q: Can I take Paw Paw Cell-Reg with medications? A: There are no known interactions between Paw Paw and prescription drugs. 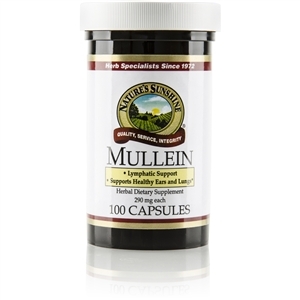 As mentioned above, thyroid supporting herbs or drugs (i.e. Synthroid) may have a counterproductive effect. However, NSP does not recommend that you stop taking any thyroid drugs, unless you are under a physician's supervision. Q: Can I take more Paw Paw Cell-Reg than the label recommendations (one capsule with food four times daily)? A: No, NSP does not recommend exceeding label recommendations. Paw Paw is known to cause nausea and vomiting when taken in higher doses. It will not work better in higher amounts. Q: I occasionally feel some minor stomach upset after taking the Paw Paw Cell-Reg. Can I do anything to help reduce this? A: Although some people tend to be more sensitive to the product than others, NSP recommends taking the Paw Paw with some food, to decrease the incidence of stomach upset. Ginger can also be used with Paw Paw Cell-Reg. Ginger has been used for more than 2,000 years and it has a history of use in reducing occasional stomach upset.